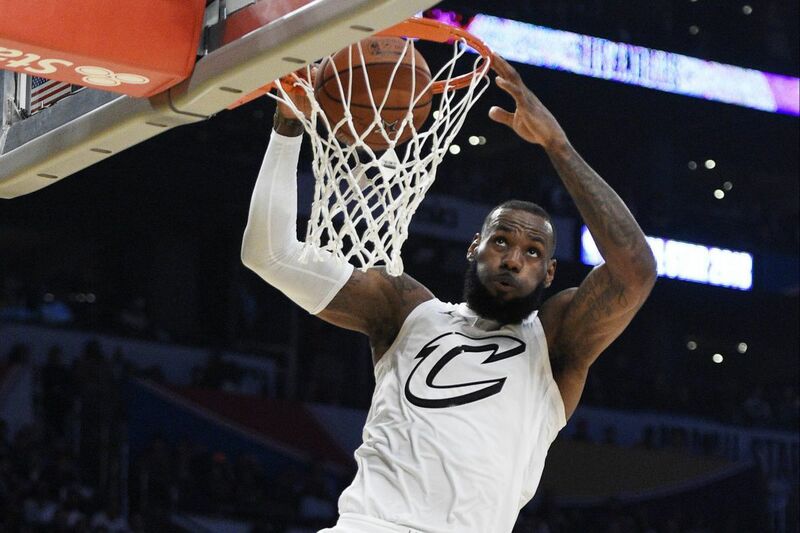 LeBron James goes up for a dunk during the NBA All-Star Game on Sunday. Specifically he made his mark on Russell Westbrook. Embiid hit a deep three over Westbrook, then on the other end, when Westbrook was headed to the basket, Embiid denied Westbrook while keeping the ball in play. It was one of the early indications that defense (though not the most intense brand) was going to be a larger part of the All-Star Game and a continuation of the narrative that Westbrook and Embiid have no plans of letting up on each other. Embiid scored the first points of the game and continued on to finish with 19 points and eight rebounds in his first ever all-star appearance. In one fell swoop, James made this year's dunk contest look like a joke. It wasn't his first and it wouldn't be his last. James has long been the player that the dunk contest has needed. Excluding the 2016 dunk contest featuring Aaron Gordon and Zach LaVine, the dunking showcase has been a yawn for years, and it becomes even more lackluster in hindsight when James throws down during the weekend's main event. Even with an increase in contested shots during the All-Star Game, nobody wanted to stand in the way of the king. After showing that he was an elite dunker, he powered his way to a fourth All-Star Game MVP after scoring 29 points to lead his team to victory. Things are headed in the right direction for the All-Star Game. The teams, drafted by captains Stephen Curry and LeBron James were not restricted to the East vs. West format of years past. The members of Team LeBron walked away with $100,000 each (a $50,000 increase from previous years for winning team players), and players from Team Stephen pocketed $25,000 each. Additionally the teams were playing for increased prize money to be donated to charity — $350,000 for the winning team, $150,000 for the losing team. The incentives and the players being involved in the team dynamic made for a more entertaining contest. There is still not going to be an intensified defensive effort that mirrors the NBA's regular season, but it at least added a tid-bit more intrigue to the game, including one of the better All-Star Game fourth quarters. Can you imagine if Kemba Walker played on a nightly basis with LeBron James and Andre Drummond? What if Joel Embiid had shooters like Klay Thompson and Stephen Curry next to him. The All-Star Game makes you wonder. What if some of the guys that haven't made it to the finals had a little more fire power on their team? It would be wrong for me to not mention the star-studded pregame circus. I'll make this quick. It was 40 minutes of nonsense that led up to the actual All-Star Game. It was too much, it was ridiculous, it had nothing to do with basketball, it was disgusting. More on that later.